BioRenovo is a Regenerative Medicine Company whose mission is to secure funding for projects currently running at the world renown Mario Negri Institute for Pharmacological Research in Italy, in ground-breaking therapies to patients suffering from kidney failure, thereby resolving, or at least alleviating the global need for dialysis or organ transplantation, as well as other associated problems, such as anaemia caused by EPO inefficiency. Main area of research and focus is regenerative medicine projects and biomedical kidney-tissue engineering with proven commercial potential. BioRenovo's primary goal as a separate private company is to generate greater exposure and corporate credibility in various research projects in order to attract and secure greater funding. A complete website solution was delivered, including initial consulting, web design concept, programming development and functionalities, research, writing and editing of all static content, custom-built content management system (CMS) for creating and managing new content dynamically, organic search engine optimisation (SEO), as well as a kick-start in digital communication channels, namely relevant useful business/research/investment portals and social media. Focus for this project was to deliver a modern-looking, fully responsive (i.e. adaptable to mobile phones and tablet devices) and content-rich website, thus being informative, as well as a strategically boosting online presence and corporate credibility. This however, must also have the capabilities to be regularly maintained, both with regards to reporting on research project developments and new advances in biomedical engineering. 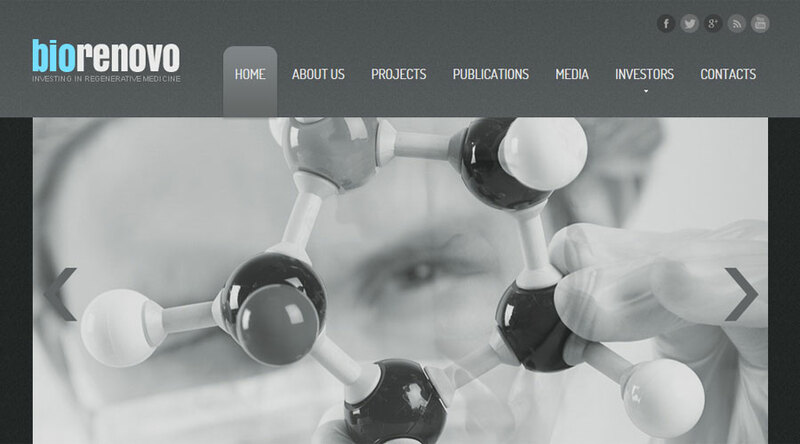 A fully custom-built Content Management Solution (CMS) was therefore integrated to the website infrastructure, allowing BioRenovo's team to maintain their research project pages, important scientific publication releases, media information and events, as well as investor resources and information. Web development services were complimented with an overall digital communication strategy, mainly via the CMS and best practice, together with relevant scientific/business/investment portals locally, in Europe and internationally, as well as a social media campaign.